I just couldn’t understand how pushing on your back could relieve aches, pains, and sickness in the body. I became interested in wellness type healthcare in 1972 after seeking relief from headaches that would last for days at a time. I was involved in several car accidents as well as a motorcycle accident where I flew 200 yards down the road after falling off going 60 miles an hour! Pills were not giving me any relief and the medical doctor didn’t seem interested in something that didn’t involve more pills or surgery. After consulting a chiropractor, undergoing an examination, receiving x-rays, and an explanation of where my headaches were coming from, I had a chiropractic adjustment and was headache free for 2 days! I had headaches for years with no relief till I received that adjustment! After that I was impressed enough to go visit a chiropractic school and pursue it as my life goal. After that experience and attending some educational classes that my chiropractor recommended, he invited me to South Carolina to visit a chiropractic school. It was overwhelming to me that there were so many people interested in helping people to attain a better level of living without drugs or surgery. That was in 1976. I began attending a local community college in 1977 to attain my required courses to attend chiropractic college. 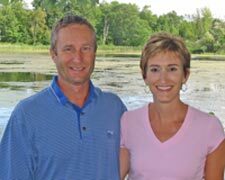 I began attending chiropractic school in 1982 in Lombard, IL. The school is now named the National University of Health Sciences. The school is located 15 minutes West of Chicago in a very busy suburban area. I received my Bachelors degree at NUHS, and was presented with my D.C. (Doctor of Chiropractic) degree in August of 1985. I found out quickly that my education was only beginning! I took a 1 year post graduate course of study in sports medicine and received my CCSP-Certified Chiropractic Sports Physician status in 1988. I continue to attend seminars on a regular basis and have done so for the last 22 years. I believe that it is important to remain knowledgeable in all facets of health and healing. First and foremost is my belief that whether you are sick or not or whether you are in pain or not, your body functions most correctly when in its most proper alignment. That is the basis of chiropractic. It is unhealthy levels of stress that cause our bodies to not function correctly thus leading to spinal subluxations. I have seen this so many times in 22 years that I know health cannot be attained without removing the causes of stress in our lives. In 1981, I was blessed by being presented with the missing link in my life which was a personal relationship with God through his son. I finally realized that there was a power beyond us that offers a never ending source of healing through prayer. A spiritual life combined with a wellness life through chiropractic is the only way to go! I met my wife Cheri, in 1988, and we were married on December 16th 1989. We have 3 wonderful children: Rachel was born in 1990, Cole was born in 1992, and Grace in 1994. We enjoy vacationing at the beach and in Canada. At home activities include golf, gymnastics, and dance classes. To say I am proud of my spouse and children would be an understatement! My wife took on the task of home-schooling our children 7 years ago and I give her a majority of the credit for the way they are turning out! Being in daily contact with them at home is a real blessing to our family. I love them and enjoy spending my spare time with them all. My wife enjoys spending time with the kids and my spare time is spent with golf. The thing no one really knows about me is I love to fish. It is very relaxing to me and when we go to Canada that is really all I do! Rachel is now 25 and is a graduate of Lancaster General with her RN degree. She works in post delivery care in Philadelphia with plans to continue on with a graduate degree in nursing. She babysits in her spare time and enjoys traveling whenever her schedule allows. Grace is our youngest and is 20. She is attending Kutztown University with a major in Electronic Media. She enjoys making and editing short films in her spare time. Our son, Cole, is 23 and pursuing a degree from Lock Haven University in Sport Management. He enjoys golf and spending time with his friends. My family is on the top of my “leaderboard” each and every day! I receive at least one chiropractic adjustment per week. My family does about the same. We have allowed our kids to make their choice for chiropractic care years ago and I’m proud to say that they come to me for care on a regular basis. Our children have never been on medication or vaccinated. I would not place my family in harms way if a medical procedure were necessary, but that has never been the case. By practicing the principles of wellness that include a good diet, nutrition, exercise, spiritual, physical and mental well-being, we’ve been blessed with a healthy family. I like the analogy that your life should burn like a candle, down to the end, flicker, and then go out. Not as a candle that is blown out and lit again and again disrupting its flow. Lord willing, we’ve been hospital and medication free as a family for over 17 years! We eat right and practice life principals of good diet, nutrition, exercise, spiritual, physical and mental well-being. Good rest and eating things in moderation is a principle that will serve everyone very well. Exercise is also something that each person needs if they are to be truly healthy and on a wellness path. Thanks for visiting our site. We look forward to meeting with you in person and learning how chiropractic can fit into your health care goals. Give our Palmyra chiropractic office a call or click here to email us and we can arrange a time to explore your options!